I was a really skinny kid growing up. I also had the misfortune of being raised on superhero comics and action films. Perhaps that’s why I developed a fascination with bodybuilding in by late teens. Though I never became a practitioner, I have a certain amount of respect for the sport. Sculpting one’s body to such a degree takes dedication and discipline. Apparently, such qualities eluded Miami’s Sun Gym gang. While packing on muscle mass, they also packed pistols and committed crimes. Their not-so-legendary exploits are now the subject of Michael Bay’s latest bit of visual junk food, Pain And Gain. Pain And Gain is purportedly based on a true story, as told by writer Pete Collins in trio of articles published in the Miami New Times. The Sun Gym gang was a group of Miami bodybuilders who eventually got involved in kidnapping, extortion, and ultimately murder. Needless to say, they proved less than adept at such things. Luckily, such hard luck tales make for good reading and even better viewing. 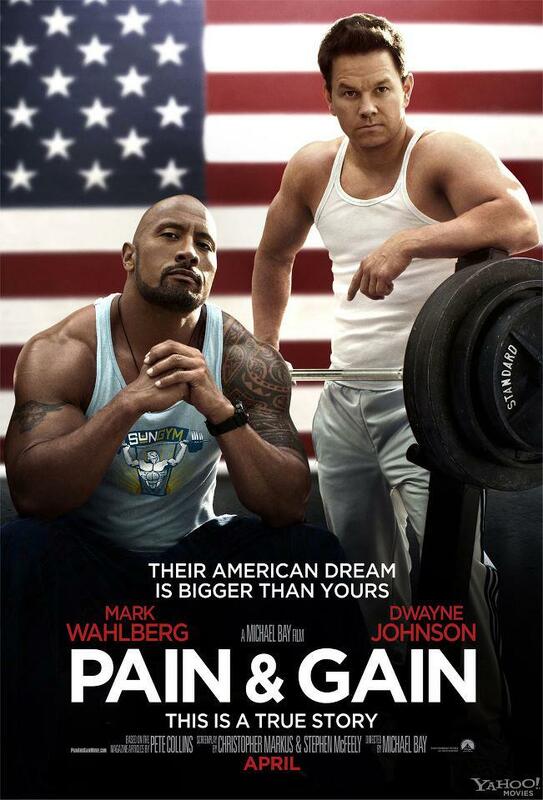 Pain And Gain is being touted as smaller, more ambitious project from director/producer Michael Bay. It boasts a budget of 22 million dollars, a mere pittance by Bay’s usual standards. However, it seems that such meager funds have been put to optimal use. 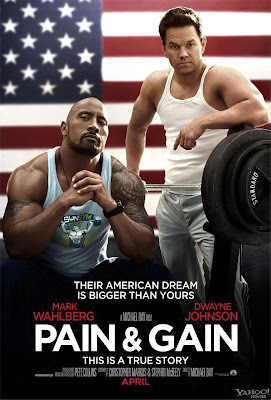 Mark Wahlberg and Dwayne “The Rock” Johnson star as Daniel Lugo and Paul Doyle, members of Sun Gym Gang. Ed Harris stars as Detective Ed Du Bois, the lawman who succeeds were other cops fail. Wahlberg has become quite an accomplished actor over the years, and Johnson is one of the most undervalued performers of his kind. Both have always been able to transition smoothly between action and comedy. Such talents are invaluable to a project like this, where an otherwise “serious” story is being played largely for laughs. The film seems to buy wholesale into the idea of muscleheads being morons. As for Mr. Bay, he’s up to his usual hijinks. His Miami has always been an overblown fever dream that makes Scarface look restrained by comparison. That approach turned both Bad Boys films into hits, their perceived quality (or lack thereof) notwithstanding. The setting, location, and subject matter of Pain And Gain fit nicely into his wheel house. It should be interesting to see his particular touch added to something that doesn’t have big explosions and even bigger robots. However, that’s not to say the end result will actually be any good. Lest everyone forget, it’s still possible to finance a train wreck on a meager budget. Excellent movie...Some of the things that happened were so outlandish I thought it was completely made up. Surprisingly, this was based on a true story of actual events. Couldn't believe it...had to Google it to verify. The awkward moment when you find out the real life events didn't went down like this and two actual people were torture to death﻿.